The Fish House Deck Bar is the most recent addition to the complex. 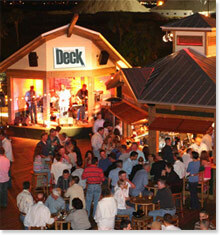 Opened in 2007, the Deck Bar encompasses 3,500 square feet of the coolest deck in town on the water! Overlooking beautiful Pensacola Bay, the Deck Bar has a bandstand, fire pit, and maritime-inspired bar with plenty of seating, the Fish House Deck Bar has quickly become the evening gathering spot for locals and visitors alike. Happy hour runs from 4 p.m. till 6 p.m., 7 days a week with live music nightly and Ladies' Night with $2 drinks every Wednesday. The Deck Bar has been recognized with a number of awards including Best Bar Overall, Best Happy Hour, Best Bloody Mary, Best Margarita, Best Place to Meet Friends After Work, Best Ladies’ Night, Best Signature Drink – Fish House Punch.